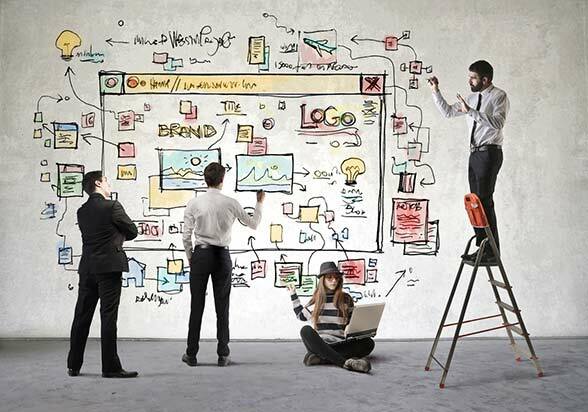 Many website builders on the market today promise to make creating your new website as easy as snapping your fingers. They offer features for beginners such as starter templates, drag and drop builder platforms, integrated SEO, marketing and eCommerce tools, and extensive customer support. We’ve reviewed the best website builders for beginners who want something simple and straightforward to get their site up and running quickly. Wix is one of the most simple website builders available. All you need to do to get started is to share your email address; you don't even have to present any credit card information. Your first task is to choose your favorite template out of the 500+ professionally designed options which contain the basics for any type of business. You can immediately get started on a template that has all you need for a restaurant, graphic design, or blogging site, to name just a few of the 70 different categories. Once you’ve chosen a template, the Wix drag and drop builder lets you customize your website without any technical knowledge. You just pick an element that you want to add, click, and drag it over to position it wherever you want. You can change color schemes and layout to your heart’s desire without a drop of coding knowledge. Wix’s site builder includes a whole slew of features. You can add elements like an online store, embedded surveys and signup forms, and more. There is also an impressively powerful image editor that helps you enrich your site with video backgrounds, 3D parallax effects, and a wide range of stock images to get you started. Wix also offers a large App marketplace which you can dip into to add any one of hundreds of add-on apps to your site. Wix’s website building plans include everything you need to keep your website running once you’ve set it up. You’ll find a full suite of SEO and marketing tools waiting for you, including social media integrations and CRM plugins. Most importantly for beginners, Wix has great customer support via phone, email, and an online forum. Just to make your setup even faster, Wix recently launched its Wix ADI option. With Wix ADI you simply answer a few introductory questions such as choosing a category for your site like ‘Photography,' ‘Blog,' or ‘Events.' Wix’s automatic intelligence ADI tool explores the web for similar websites before presenting you with a complete customized site. You can easily replace the elements that you don’t like with something that’s better suited, but it saves you a lot of time compared to starting from scratch. 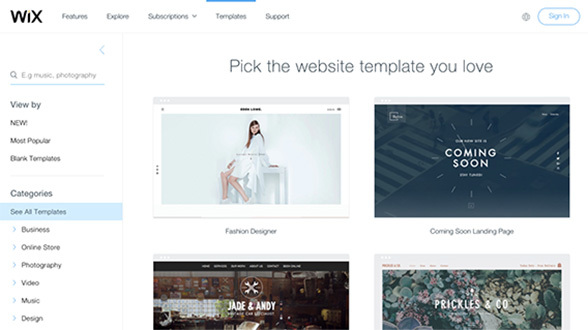 Site Builder offers a huge range of templates. You can browse over 1,000 professional templates that cover pretty much every category of website you can think of and every template has the option to add a blog site, too. SiteBuilder provides users with a very large image library with thousands of images so that you can fill in your site with appropriate pictures immediately. Once you’ve got started, SiteBuilder lets you customize your site using an intuitive drag and drop system that helps you create a professional-looking site without any tech knowhow. If you’re using a plan that includes a mobile-responsive site, you’ll find that you can tailor it to your requirements with the same easy-to-use drag and drop platform. SiteBuilder provides users with fully integrated social media marketing tools and Google maps plugins. If you upgrade to one of the paid plans, then you'll also get access to extensive SEO tools and analytics which you can employ easily and swiftly with the click of a mouse. The top tier eCommerce plan adds a fully functional online store with analytics and a secure checkout to make it easy for small and medium businesses to get selling online without code. Although SiteBuilder is quite a simple and plain looking platform, that simplicity is what makes it such a smooth and intuitive web builder for beginners. If you do get stuck at all, SiteBuilder's live chat and email support are available 24/7. Users who live in the USA, Canada, the UK, or Australia can also turn to the phone for around the clock support. 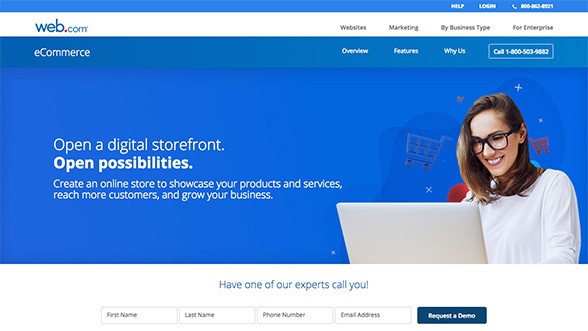 For beginner website builders who are nervous about a do-it-yourself approach, SiteBuilder also has a do-it-for-me option which takes the difficulties out of your hands entirely. Web.com brings a different approach to building your new website with both a do-it-yourself and a do-it-for-me option. The DIY website builder is not the easiest option for beginners and does suffer from a number of frustrating bugs. However, it also offers an intuitive drag and drop interface so that you can build your website one element at a time, placing each item exactly where you want it. One great aspect of Web.com’s website builder platform is that you can switch between templates as often as you’d like without losing any of the work you’ve already done. This is handy because Web.com provides over 2,500 templates, organized into 30 different categories. Web.com offers an extensive number of eCommerce features for users who pay for one of its eCommerce website plans. You can add a fully featured online store that includes features like product descriptions, the ability to generate coupon codes, CRM integration, and tracking codes for online ads. SEO tools are included in the custom-built versions, and your customers will be able to search and browse your product range with ease. If you’re feeling confused or run into any trouble on the web builder platform, Web.com provides a coaching service with tutors to guide you and explain the principles of website building. For real website building novices who don’t want to build their own site, Web.com’s build-it-for-me option is a great choice. Users who take this route will discover not just a one-off website building service but a full and ongoing website management plan. You’ll begin by discussing your website needs with a small business analyst who will create a website according to your wishes, saving you the time and stress of making your own site. The site will be designed with full regard for SEO and integrated with social media networks and other marketing tools. You can access analytics and reporting functions, inventory tracking and management, shipping calculators, and credit card processing without having to lift a finger to set it all up. Web.com will also continue working with you to develop your site and oversee Ecommerce functionality. As with every decision, there are a lot of things to consider. Your choice of the best website builder for beginners will depend on factors like whether you want to do it on your own or get it done for you, how important it is to access a powerful image editor, and what level of guidance you need to manage the task. Use these focused reviews to make an informed decision and get started on your website today.